Hydra Design Group proudly opens the doors of its first endeavour: The Grid Food Market, a new curated dining hall with a myriad of mouth-watering options for the eager foodie. The Grid Food Market is the latest exciting addition to Power Plant Mall’s roster of restaurants, further enriching the Rockwell community’s dining experience. Comprised of both familiar and exciting concepts from some of our country’s top chefs and restaurateurs, this dining hall guarantees that foodies are set to be spoilt for choice in the best way possible. In it are booths by top chefs like Josh Boutwood, the Rambla Group, and Happy Ongpauco-Tiu, to name a few. For this concept, the focus is not to wow people with flashy dishes, but with downright incredible food. Charles Paw, CEO of Tasteless Food Group, is responsible for the coming together of the Hydra Group, which was established in the last quarter of 2017. From a client of some of these design firms, Paw soon became a founding partner of this creative force. The collaborative design hub is made up of separate entities (Acid House, Inksurge, KM Interior Design, Plus63 Design Co, to be specific), all of which collaborate to produce creative concepts. The Grid Food Market is the first ever concept produced under the Hydra name. The well-lit space is sleek and sophisticated; individual branding takes a backseat as all stalls are identical, each one assigned a number and a sign that lists the options available. Seating should not be a problem (though diners have been coming in droves! ), as it is designed to fit a few hundred. Happy Ongpauco-Tiu, whose booth serves her take on the all-time Filipino favourite lechon—choose from porchetta, gourmet lechon manok, angus beef belly, and lechon spicy tuna belly—is looking forward to giving diners an option of rub flavours, sides, rice, and sauces to go with their mains. Adds Josh Boutwood of Burgers and Bits, “This is very different from all my other concepts, and is our first establishment in both a food hall and mall.” Pastry chef Miko Aspiras and Kristine Lotilla come in with Workshop by Le Petit Soufflé, where they bring in their clever dessert concoctions, some of which have never been produced before. How is The Grid different? 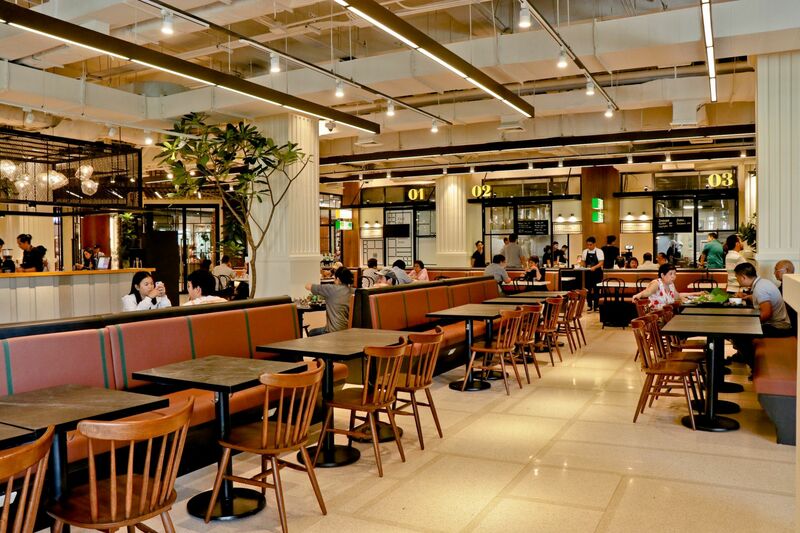 This food hall stands out from others because it goes back to basics. Here, the emphasis is on the food: high-quality dishes that will keep diners coming back for more, not décor, gimmicks, or fads that may grow old over time. Each stall will not be individually branded in line with the proprietors’ existing brands, but will instead look streamlined and uniformed. The signs will display a cuisine or type of food that is being sold, further enforcing their food-first focus. As this is only the first phase of the The Grid—they are set to launch in three phases—not all booths are open yet, but there is plenty to be enjoyed!